As previously stated, 2010 was a wild year, and we are think 2011 will be equally entertaining. Here are a few things we are watching for this year. While they consistently sport one of our least favorite team kit/helmet combos, they have our attention this year. Phillipe Gilbert is always in the mix and that won't change in 2011. Many people questioned the future of this team with the departure of Cadel Evans. 2010 proved to be a solid year for Omega Pharma Lotto. Jurgen Van den Broeck had an amazing Tour last year and has come completely out of the shadow of Cadel Evans. If he picks the right race to focus on like the Vuelta or perhaps the Giro, he can end up on the podium. 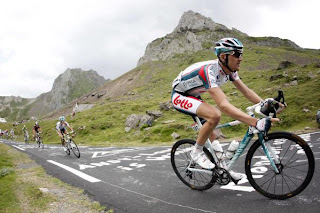 Van den Broeck posted a 7th at the Giro in 08, 15th at the Tour in 09 and 5th at the Tour last year. He can climb and TT and is a true threat as a GC contender. André Greipel got away from Cav and is now THE sprinter for this team. It should be interesting to see Griepel vs Cav with all the other usual suspects mixed in. This battle could end with a wheel swinging encounter! Will The Shack be relevant? With an aging AARP roster, the Shack team was built to win in say, '06. I feel losing Taylor Phinney was the biggest blow this team could have taken. With the recent addition of the very vocal and still quick Robbie², things got a little more interesting. 2010 was a very forgettable year for this team overall. They got more press from time on the ground, fights with race organizations and "jersey gate" than they did from being on the podium. With sponsorship in question for the next season we bet Johan is able to get a few results with Levi, Kloden, Popo and Jani. We can see this team capable of winning a few smaller stage races like Paris Nice, California or Colorado. They should be completely free to hunt for stages at the Tour (IF they get in). Our wish would be for Levi to focus his season on winning the Vuelta. This race has been very good to Levi, it put him on the map and is the Grand Tour he can win. Have we seen the best of Tom Boonen? Tom had a really rough year in 2010, with a string of 2nds and stinging losses to Cav and Fabian. Quick Step has had some big changes for 2011, including our favorite kit so far. Some feel the addition of Gert Steegmans will offset the loss of Stijn Devolder. We don't see it that way, it looks more and more like it is all on Tom for both Flanders and Roubaix. Anything can happen in these races; if Fabian has a mechanical or stops to drink a beer, Tom has a great shot. Looks like his knee is back to 100% and if he is mentally right (no underage girls, blow and or car wrecks) - Tom is still one hell of a bike racer. If he gets off to a rough start and Lefevere gives him Stijn treatment in the press, we vote Boonen "most likely to lay a beat down on his director". Will Basso REALLY try to win the Tour or just keep saying he wants to? Looks like we won't really know until May what the green team is planning. First reports were that Nabali would go for the Giro win and Basso would focus on the Tour. Now it sounds like Basso will ride in both in his attempt to win the Tour. We have to admit we are a bit baffled at the latest trend to ride the Giro and the Tour since it hasn't worked out for anyone since Pantani. Love him or hate him, Lance was dialed in on the Tour and showed people how to win it. Contador followed that plan and minimized his racing (almost to a fault last year) to arrive in July for the win. Not sure why Basso doesn't go all in and give the Tour his complete focus. He has 2 Giro wins (1 that is believable) and 0 Tours. It seems like a no brainer to give his complete focus on Le Tour, but then again, we're not Italian. Will Taylor Phinney be influenced more by Cadel or by George? Looks like he will be in the right races for his 1st year as a pro, with a chance to win one. Most likely Taylor will win a TT and not a road race. The big question as we see it, will Taylor learn more from George or Cadel? 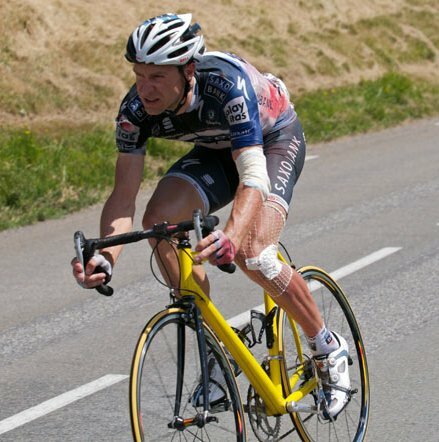 For most of his career Cadel's memoir could have been titled "Riding for 2nd: Confessions of a Wheel Sucker". That all changed after his World's win and Cadel showed us, that when he attacks and takes risks he can win big races. We like Hincapie as much as anyone, we think he is one of the greatest US cyclists. That said, he rides classics races like there is a chance the leaders will get hit by a bus. George has not put in a dig in a classic in years, and we hope Taylor does not adopt the wait and hope strategy. Tom Boonen learned a ton from riding with Hincapie and we hope the same can be said for Taylor Phinney. We believe "The Great White Hope" can win multiple classic races if he takes his chances and rides for the top step, not the top 5. This is probably his last year (for real this time) but why watch Jens 2011? Because he is JENS, the Chuck Norris of cycling! Once again he will rip the legs off the peloton and give us plenty of one liners. As long as Voigt is racing it will be a race worth watching! Jens rockin the ultra compact frame. ﻿ We want to see great racing all year, and we love the Tour de France. But, what we really hope for is that some of the GC contenters will give up their yellow jersey dreams. We would love to see the likes of Christian V, Mick Rogers, Levi, or Cadel Evans add a Giro or a Vuelta to their palmarés.